High schools can form the backbone of community life. They serve as a place of learning, but also as the local sports arena or performing arts center; a polling place or town hall; occasionally, a house of worship. So it makes sense that a high school should occupy a prominent location in the community as well. This proposed plan from Grimm + Parker Architects shows a new Wheaton High (left) and Edison High (right), with Randolph Road running along the bottom. Image courtesy of Wheaton Patch. That seems to be the thinking behind plans to build a new Wheaton High School, which is one of Montgomery County's oldest, having opened in 1954. A few weeks ago, the Board of Education looked at options for rebuilding Wheaton High and the adjacent Thomas Edison High, which has a part-time vocational program. 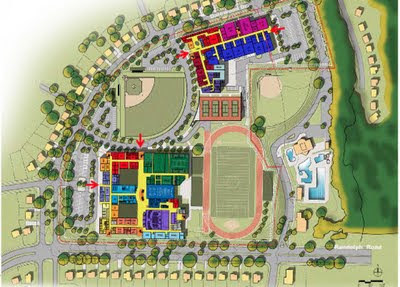 The favored scheme, according to Wheaton Patch, is one that places each school in its own separate building, one on either side of the building both schools currently share. Not only does this allow construction to take place while classes are in session, minimizing disruption, but it puts Wheaton High School in a more prominent location. Today, Wheaton and Edison's shared building backs to busy Randolph Road. As cars speed by, all they see of the schools are the football stadium. The county and Calverton-based architects Grimm + Parker, who will design the new campus, propose building a new Wheaton High where the football and baseball fields are today, placing the school right on Randolph Road. This move emphasizes the school's significance to the community, putting it in full view of the thousands of people who come through Randolph each day. The proposal is also more convenient for students who walk or take public transit to Wheaton High. That's especially important at a school whose catchment area extends as far as Takoma Park and Aspen Hill and where four-fifths of the student body is on free or reduced lunch. People coming from Randolph Road, served by multiple Metrobus and Ride On bus routes, or the Glenmont Metro station a mile away, would now be able to walk right into the school rather than circle around the entire campus. Making it easier to reach Wheaton High without a car will give students a greater sense of independence and reduce their reliance on rides from parents or friends with driver's licenses who aren't allowed to carry passengers. Speed cameras on Randolph Road. Wheaton High School's football field can be see at far left. Bringing Wheaton High up to the street could also help with the issue of speeding along Randolph Road. 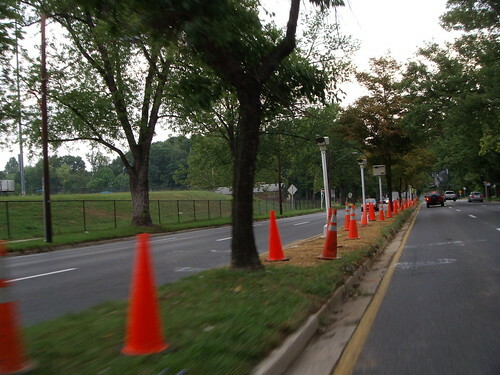 In 2007, the county placed speed cameras on Randolph behind Wheaton High, arguing that it would improve pedestrian safety. Currently, the only thing motorists see along Randolph Road are trees and the school's fence, the kind of featureless environment that encourages speeding. Grimm + Parker's plans show a new Wheaton High located just a few feet behind the sidewalk, close enough to make drivers more attentive of their surroundings and encouraging them to slow down. The design for a new Wheaton High isn't perfect. Though the building would be located on Randolph Road, the entrances would face away from the street, allowing buses and cars to drop students off without stopping traffic. But shouldn't a school that's supposed to give a "new fresh start" for Wheaton present itself to the community rather than turning its back on them? There are few examples of other high schools in Montgomery County that actually face the street, and those that do, like the old Blair High or Bethesda-Chevy Chase High, have been altered so that you enter on the side. Still, I hope that the architects can do things differently at Wheaton. A new Wheaton High School will be a place to learn and a destination for the community. And by placing the building on one of Wheaton's busiest streets, and creating a prominent entrance on that street, it'll become a treasured landmark as well.